How do everyday people view and make sense of capitalism and its role in their work and personal lives? What are the discourses they use in their common-sense understandings of the economy to defend or reject capitalism as a system? 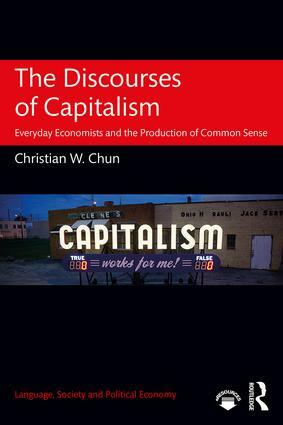 Chun looks at how dominant discourses in social circulation operate to co-construct and support capitalism, and the accompanying counter-discourses that critique it. This is key reading for advanced students of discourse analysis, language and globalization/politics, media/communication studies, and related areas. A video lecture by the author can be accessed via the Routledge website (www.routledge.com/9781138807105) and the Routledge Language and Communication Portal (www.routledgetextbooks.com/textbooks/languageandcommunication).